If you have never sailed on a wooden sailboat, you are in for a wonderfully unique experience. If you have already, then you understand why their sailors are devoted to them. Rhodes sailboats are renowned for their sea kindliness, sailing through the water not on top like more modern fiberglass boats. These boats don’t fight against the swells but cut through them gracefully. These classic wooden sailboats allow you to feel the power of the wind propelling you. Just the sound of the water moving past the hull. You’ll be listening to the wind in the sails and the cries of different sea birds. The Spartan (a Rhodes 29 design) is a classic wooden sailboat was built in 1960. Spartan’s large cockpit, spacious cabin top seating, and ample cabin space make a great choice for sailing along the California coastline. This yacht rental can accommodate up to six passengers plus crew. Philip L. Rhodes was an influential sail boat designer from 1920 to 1970. Because he designed many boats for ocean racing, especially to Bermuda, his boats had to be fast and able to handle the powerful winds of his chosen race courses. They also had to be comfortable for long trips. 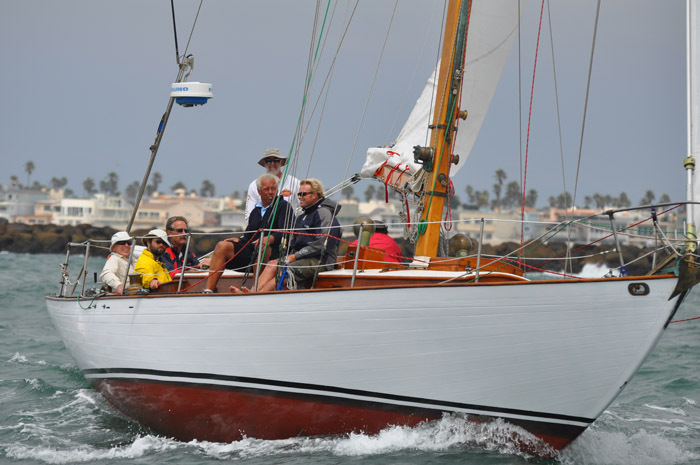 Spartan regularly participates in harbor races and classic yacht regattas from San Diego to Channel Island Harbor.